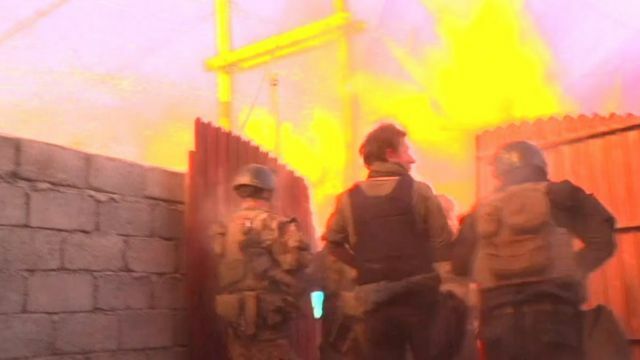 Iraqi troops face bomb attack in Mosul Jump to media player BBC Arabic's Feras Kilani and cameraman Marek Polaszewski are with Iraqi special forces as they enter the populated areas of Mosul. With Iraqi troops as they near Mosul Jump to media player Iraqi soldiers near the centre of the stronghold of so-called Islamic State in the fight for Mosul. The black sheep of Mosul Jump to media player Oil fires started by IS militants as they retreated to Mosul have blighted the Iraqi town of Qayyarah, polluting the air and turning sheep black. Mosul 'feels like living in a prison' Jump to media player "Ahmed" was a student in Mosul when IS militants overran the northern Iraqi city in 2014. Before escaping to safety this summer, he kept a secret diary for the BBC. Why the battle for Mosul matters so much Jump to media player Caroline Hawley explains why the battle to retake Iraq's second city, Mosul, from so-called Islamic State, is so important. Mosul battle: What's the significance? Jump to media player In June 2014 the Islamist group which calls itself the Islamic State in Iraq and the Levant captured Iraq's second city, Mosul. Iraqi forces fighting to take control of eastern parts of the city of Mosul have faced fierce counter-attacks from fighters of so-called Islamic State. BBC Arabic's Feras Kilani and cameraman Marek Polaszewski were with Iraqi special forces as they entered the more heavily populated al-Zahra district, which was once named after Saddam Hussein.